Whimsy by Shellye: Let's HOP! The time is here...time for the Your Scrapbook Stash Blog Hop...let's go! You should be here from Kristin's blog. But (for those of you new to blog hops, like me!) you must, must, must leave a comment on the actual posts regarding Your Scrapbook Stash's Blog Hop. 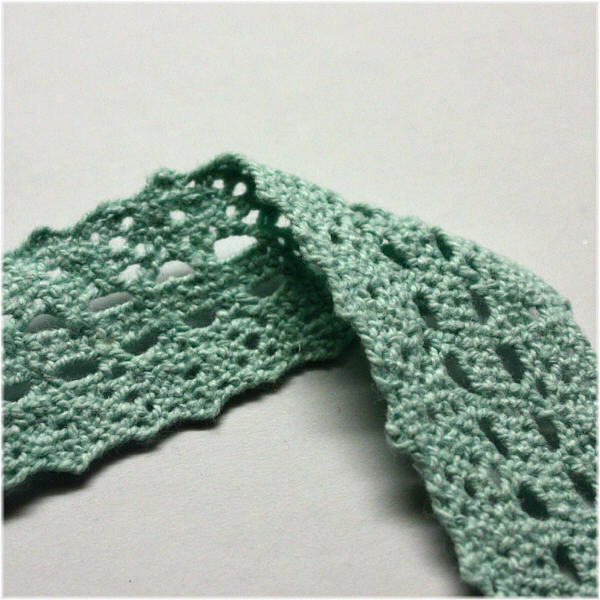 1.Take your desired amount of crochet trim or ribbon; I used about 2 foot of The Girl's Paperie JUBILEE crochet trim. 2. From the right end, fold the edge of the trim over to the left (as shown in photo #1). Leave about a 2" tail. 3. 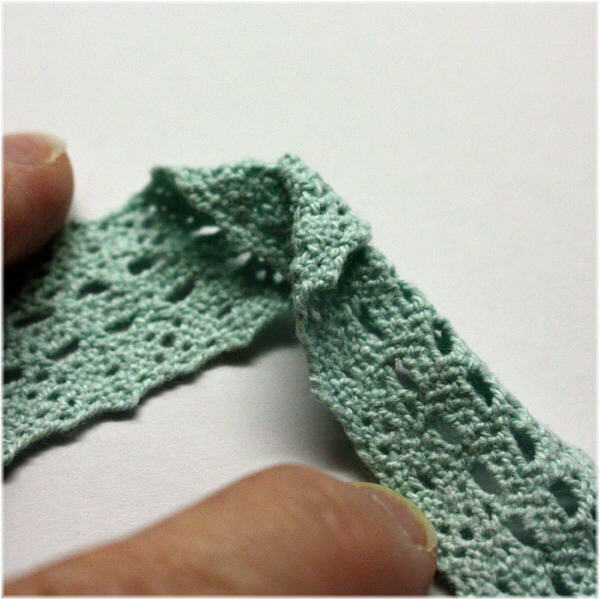 Next, fold the folded edge again to the left (you may do this a couple of times, depending on the width of the material used.) Photo #2. 4. 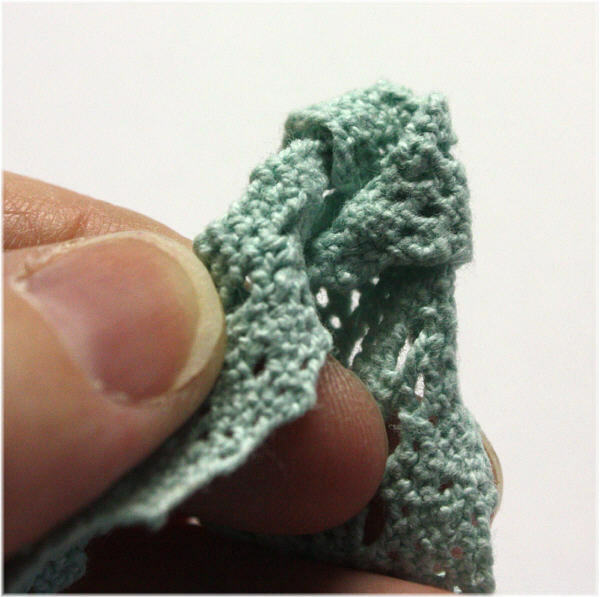 Hold the folded end in your right hand securely and the longer length of trim in your left hand. 5. With the left hand, begin turning the trim as you work counter-clockwise against the trim held in your right hand. Photo #3. 6. 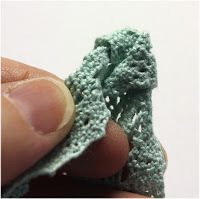 Continue folding the trim as you create the desired 'petal' looks. 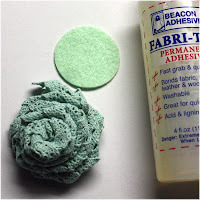 It maybe necessary to add a little dab of fabric glue between layers to secure it as you're working. 7. Once you've reached the desired look, snip off any remaining ribbon and carefully glue down with fabric glue. 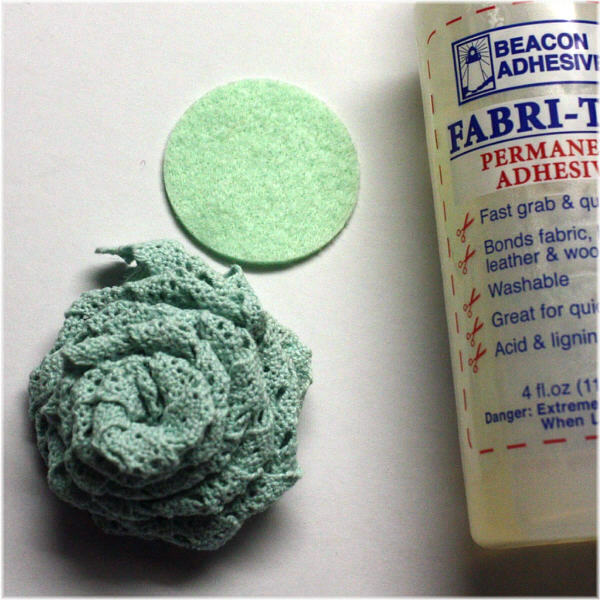 Attach to a felt or paper circle. Your Scrapbook Stash NOW carries GLUBBERS from Cosmo Cricket, which make the ideal base for your fabric flowers. Perfect for cards, package or bag accents, lapel pins, hair bands, barrettes, Christmas tree decorations, jar toppers and lots more. I really liked working with the crochet trim; it's easy to manipulate and stays true to form as you're working. Let me know if you have any questions. Enjoy the HOP...see you soon! That is gorgeous! Thanks for the tutorial! I am going to have to give that a try! Such a fantastic flower, thanks for the idea. Definitely going to try that one. Thank you for the tutorial! Beautiful flower! Holy smokes, that's awesome! Very nice tutorial, too! 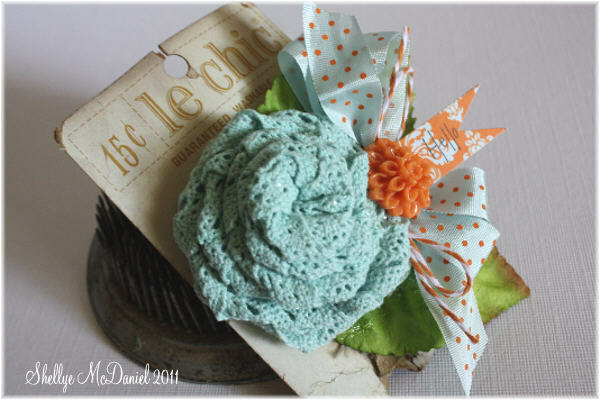 What a pretty crocheted flower! Very cool idea! Ohhh..love this flower! You make it sound so easy..lol!! I have that trim in orange & blue..will be trying this very soon!! SuperCute! I love handmade flowers! Thank you for the tutorial! Awesome flower, thanks for the tutorial! love that flower! thanks for the tutorial! Thank you so much for sharing your flower and the chance to win. I going to try and make it thanks for the tutorial. Wowsers! That is one beautiful flower!!! LOVE it! Thanks for the tutorial! That is a great tutorial! Thanks! Thanks for the tutorial!!!!! This will be fun to try!!!!!! Gorgeous flower! Thanks for the tutorial! Beautiful flower idea! Thanks for sharing!! Beautiful flower.....I bookmarked the tutorial to give it a try when I "finally" have some free time. Thanks for the tutorial. Love the flower. I'm going to try that on a card. thanks so much for the tutorial! i loove that flower! I have been hearing about the glubers...I will have to go check them out! I LoVE the girls papery, and this tutorial is great! Thanks so much for the chance to win. Hi Shellye!! So good to see your beautiful work again! I am going to give these flowers a try - you make it look easy, but I know from personal experience it's not! !